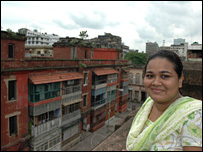 Tumbledown Bow Barracks, a near century-old red brick housing block in a back alley in the eastern Indian city of Calcutta, has not changed much for its third generation resident Kimberley Gomes. Many of its Anglo-Indian residents still feast on pork vindaloo, listen to Engelbert Humperdinck on the few remaining turntables, and swap tales on lazy afternoons sitting on their slatted verandas. But for younger community members like Ms Gomes, college-going daughter of a travel manager father and a secretary mother, there is little time for such leisure. After finishing college, she plans to become a stewardess in India's flourishing airline industry. So these days mum is pushing her daughter to join the local gym to lose the extra pounds to be shipshape in time for the job interview. "A couple of girls in our housing complex have become hostesses with leading airlines. They are very happy," says Ms Gomes, 22. The flight attendants of Bow Barracks have defied a stereotype about Anglo-Indian women - who are generally teachers, secretaries or telephone operators. Across the narrow street of the colonial barracks turned Anglo-Indian ghetto, 24-year Leon Nathaniel, son of warehouse manager father and a telephone operator mother, is also demolishing a stereotype. 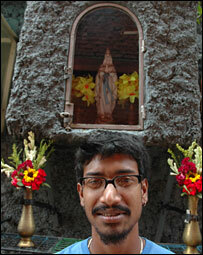 He works in a 24/7 call centre at the info-tech hub of Salt Lake on the city's eastern outskirts. In another time, Leon Nathaniel, archetypal Anglo-Indian young man, would have been working for the Indian railways, or a well-known local energy utility company. Other standard occupations were working as musicians or as waiters in city restaurants. "I haven't faced any discrimination. And there are more opportunities for us than ever before," he says, taking a break from a Bow Barracks street cricket game where soft-drink crates double up as wickets. On India's 60th anniversary of independence, Anglo-Indians, a dwindling community of mixed Indian and English ancestry who speak in English, are redefining themselves. They are taking advantage of the country's economic boom in services, moving to jobs where proficiency in English is a bonus and out of ghettos into mixed neighbourhoods. They are gyrating to Bollywood pop, celebrating Hindu festivals, and dating outside the community. Today, in Calcutta, Anglo-Indians own restaurants, beauty salons and property firms. They work for call centres, newspapers, airline companies, and hotels. "We are imbibing local cultures, and local cultures are imbibing ours. The Anglo-Indian is happy to be a part of the new India," says Barry O'Brien, a lawmaker in the West Bengal assembly and social activist. He belongs to a well-known Anglo-Indian family which, in many ways, mirrors the community in India - making good of opportunities at home and abroad, and becoming a part of the mainstream. His father Neil taught English, published books, and single-handedly made quiz shows popular in Calcutta. Barry's elder brother Derek worked as a journalist before making knowledge shows a sizzling little industry. Today, Derek is also a voluble member of a regional anti-Communist political party where speaking in English can actually be a liability. Barry has been a journalist, run a school, and is now an educator and activist. He, like Derek, has also joined politics, as an Anglo-Indian legislator in the West Bengal assembly nominated by the Communist-run government. (Most state governments in India nominate one member of the community to the local legislature.) The other brother, Andy, a well-known sports journalist, has migrated and lives in Australia. 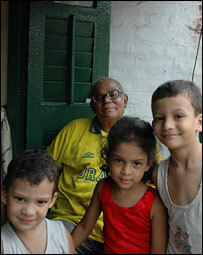 "In the 1940s and 1950s, a lot of Anglo-Indians were asking themselves, 'Do we belong here?' Let us go home.' Wherever they thought home was," says Barry O'Brien. So there were waves of community migration mainly to imaginary homelands like Australia, New Zealand, UK and Canada. There are even about 1,000 Anglo-Indian families working in the Gulf countries, according to one estimate. Today, the considerably diminished community, mainly concentrated in eastern and southern cities like Calcutta and Chennai, doesn't have a clue about how many of them have stayed back home. There are a little over 100,000 of them left in India, reckons Harry MacLure, who lives in Chennai and publishes a community magazine. Others don't want to hazard any guess in absence of a community census. But small numbers haven't stopped the community from asserting its identity - the 132 families of Bow Barracks, upset by plans to demolish the derelict housing block, recently negotiated with the authorities to move into a new building for the families in the neighbourhood. Some of them were also incensed about their "stereotypical" depiction in a new feature film by local director Anjan Dutt, and even called for a ban on the film. This leads many community members to wonder whether they could do more to mingle with the mainstream. "For one, we could easily be more inclusive," says Derek O'Brien. "My dream of Anglo-Indian inclusiveness," he says, "will be the day a member of the community enters the parliament on his own by winning votes rather than being nominated." That could be a difficult task on India's increasingly fragmented political scene where caste and community groups root for their "own" parties, whereas, as Barry O'Brien quips, "I don't even know how many people I represent!"